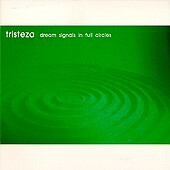 Dream-esque landscapes interweave with jarring guitars and subtle rhythms, Tristeza's aptly titled Dream Signals in Full Circles is a rich album suitable for bedtime or an after work nap. Crisp guitars sparkle while airy rhythms spread through out the songs. At times it seems like an ongoing dream sequence set to music, while at other times a vision seems to be realized. Either way, they provide the soundtrack to many happy dreams. I'll give it a B.